Forest fires and man-eating tigers make for easy headlines but what about invading flora in a forest? The ecological equilibrium of an ecosystem can be maintained only by balancing the floral and faunal population. But often ecosystems like shola forests, evergreen forests, grasslands, plain forests, mangrove forests and aquatic ecosystems get badly affected due to invading alien floral species. Invasive alien plant species are non-native species that spread and interfere in a new ecosystem by posing a serious threat to the native biodiversity, leading to economic loss. Invasive species don’t allow local species to grow and wildlife to move through. A resin like substance that oozes from such alien species makes the soil acidic, preventing the growth of any other plant species. Species like Lantana, that grow extensively, create a mat-like structure leading to degradation and destruction of the biodiversity. As a result, herbivores like Gaur, Chital and Sambar are deprived of their food. This also affects the survival of carnivores such as tigers and panthers, interlinked to the ecological equilibrium. 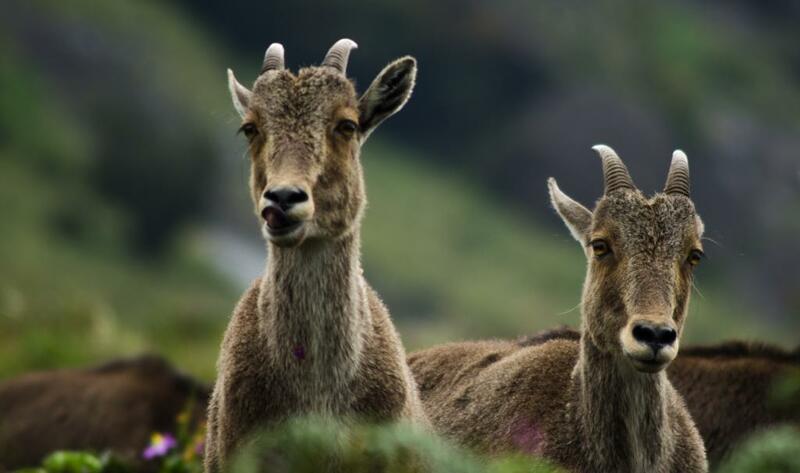 In the Western Ghats, where vast plantations of eucalyptus and wattle were raised in the past by converting grasslands and shola forests, the original habitat of the Nilgiri Tahr has been devastated. Nowadays, the Indian Bison makes frequent visits to the Kodaikanal town in Tamil Nadu because of the non-availability of food plants due to extensive plantations of alien species. Many alien species of flora, introduced mostly by the British, have multiplied to a great extent mainly in the Western Ghats. Vast plantations of eucalyptus, wattle (Acacia) and pinus can be seen across the upper slopes of the Nilgiris and Pulney hills interspersed with Lantana camara. Prosopis juliflora, Parthenium hysterophorus and Eupatorium odoratum can be seen on the lower slopes. Most species such as Eucalyptus, Wattle (Acacia), introduced from Australia, have become highly invasive. Introduced about four centuries ago to create tannin in the Nilgiris have colonised the grasslands extensively and encroached upon the adjoining shola forests. Eucalyptus has also become a menace and there is widespread discontent among the locals. Planting of this species has been banned from 1987 onwards in the Nilgiris and the people from the plains are also up with arms against raising such species by the forest department or even by any other wood based industry. In the last few years, the Forest Department has taken measures to stop the invasive species from spreading such as planting native floral species. The removal of eucalyptus and wattle is being carried out in the Reserve Forests of the Nilgiris and Kodaikanal. Although the eradication of these alien species may not be possible in a short span of time, if the measures are taken persistently, it is likely that the landscape may turn into its original vegetation in the long run. Intensive planting of the indigenous floral species should also be conducted after removing the alien species. A dedicated and scientific approach is the need of the hour. Attempts are being made to eradicate the Prosopis juliflora and Lantana camara as well since they compete to establish the natural regeneration of the native species. Prosopis juliflora, which was introduced during the sixties mainly to meet fuel requirements of the rural population, has become a menace. Action is being taken to eradicate it from the reserve forests and other water bodies. Ecologists are of the view that the removal should be in a phased manner with subsequent planting of the native floral species in order to improve the biodiversity. Since the alien species exist for the past three to four decades, complete eradication will take not just time but also sufficient funds, manpower. It is time state and central governments address the situation with the view to increase the biodiversity and maintain the ecological equilibrium.